Most of the time your data includes a row for every customer or sales or action, but you want to see it grouped together by month, or sales rep, or lead source. This is easy to do with the Group Data transform. This is a two-step process: First, select the column(s) you want to group by, and then select other columns and how you want to aggregate them. There are more detailed instructions below after this example. Click the Add Transform button, then select Group Data. In the working area, select the column that contains your date or the column you want to group by. Note that Grow will check the column you've selected to check if it's a date, and if it recognizes the format as a date format, it defaults to selecting the 'Treat as date' checkbox for you. You may still need to manually click the 'Treat as date' button if Grow doesn't do this for you and if you are working with a date column. This 'Treat as date' checkbox gives you other date-specific features. 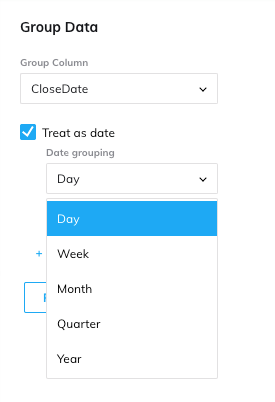 Here are some additional options you have when treating your grouping as a date. If your company tracks their weeks starting on Monday, this option will set the week to that schedule. 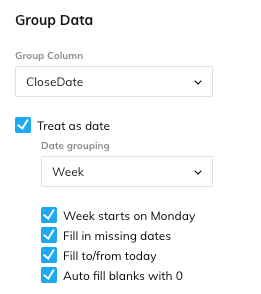 If you data skips or doesn't return days without data, such as a day on a weekend without sales, you can check this box to fill in those missing dates. This option will appear when you select the Fill Missing Dates box. Check this box to fill in the dates to the present day. This is good for making metrics dynamic. This option will appear when you select the Fill Missing Dates box. The default behavior when filling in dates is to fill in the date only, and leave the row blank. But if you know that filled in dates should be 0, check this box. After you've chosen what you want to group by, you'll need to then tell Grow what data you want to aggregate within that selected grouping. At the bottom of the working area, select the aggregation you want to use (sum, average, etc.) and then the column you want that aggregation applied to. You can add as many columns and aggregations as you need. After running this transform, the first column(s) will be those you selected in the first step, and the columns after that will be the aggregations. If you would like to rename the columns to not show the "Sum of..." prefix, you can use the Rename Columns transform.